Argentina signs the e-Infrastructure sustainability agreement! OurGrid 4.3.1 has just been released! - Under the auspices of RedCLARA, discuss policies and plans for the long-term sustainability of SG-based Advanced Computing Services, with special emphasis on Latin America. by means of UNAM Webcast. Click here to go directly to the agenda with all the contributions. Providing Virtual Research Communities (VRCs) with the e-Infrastructure and Application-related Services required to improve the effectiveness of their research. 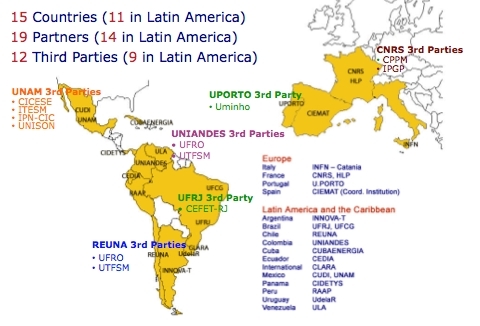 The Project encompasses 19 Partners from 15 countries in Europe and Latin America.